I remember being surprised to learn that a CW signal has a bandwidth (albeit small), but when I thought it over, it made sense. Essentially, we are modulating the carrier with a low frequency square wave. This would explain key clicks: a perfect square wave has infinite bandwidth, but if you smooth the rising and falling edges, the bandwidth goes down. This got me thinking. If, theoretically, we could key up and key down precisely on the zero-crossings of the carrier, it seems to me that there would not be any distinct rising or falling edge. Then, would the signal have zero bandwidth? You raise an excellent question and your thought processes are indeed on the right track. First some background. An ideal, uninterrupted sinusoidal carrier has zero bandwidth. Real world factors such as phase noise, amplifier distortion, etc. produce a measurable bandwidth of the carrier. When the carrier is keyed on and off as it is with Morse code, this is a special form of ASK (Amplitude Shift Keying) called OOK (On Off Keying) as it is discussed in professional literature. Normally, the bandwidth of the modulated OOK signal is minimized when the keying waveform rise and fall times take on a Gaussian or raised cosine form. 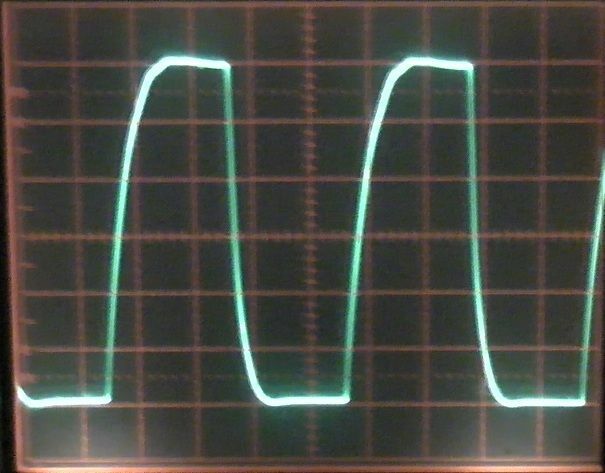 Most amateur radio transceivers are using simpler RC filtering to shape the keying waveform, resulting in less than ideal bandwidth but at least avoiding the key clicks from the otherwise sharp raise and fall time of the modulating signal. In any case, it is the rise and fall shape of the keying waveform that determines the bandwidth of the modulated signal. When the transition of the modulating signal is synchronized with the zero crossing of the carrier signal, this is known as coherent OOK modulation. This is, of course, much more difficult to implement than a simple, non-coherent RC filtering scheme so it is not commonly seen in amateur radio applications. However, when implemented properly coherent OOK does reduce, but does not eliminate, the signal bandwidth. The "residual" bandwidth is largely due to a variety of real world factors including non-instantaneous keying time which introduces a distortion of the carrier waveform. Any distortion, no matter how small, of the sinusoidal carrier will result in a non-zero bandwidth. So you could win over some of the CW aficionados with a coherent OOK transmitter but in a hobby market the commercial viability of such a transmitter would be a question of price elasticity. Perhaps in this new era of DSP based radios, the lowered cost of implementation will make this commercially viable. But given that few, such as the Elecraft K3, amateur radio transceivers implement Gaussian keying, we still have a ways to go to optimize the bandwidth of our CW signals. There is no way to transmit information in a signal with zero bandwidth. Switching the carrier at the zero crossings would reduce bandwidth but not take it to zero. There's a mathematical explanation on DSP StackExchange: Does “keying on” a sine wave at a zero-crossing reduce its bandwidth? Summary: in the worst case of switching on/off at the peak instantaneous amplitude, the sidebands fall off in proportion to 1/f. In the best case of switching at zero crossings, the proportion is 1/f2. A significant improvement, but still far from zero bandwidth! Without delving into math, the simple explanation is that a band-limited signal must not only be continuous itself, but so too must be its derivatives. A hard switch at a zero crossing has a discontinuity in the first derivative at the switching point. For having smooth derivatives, the Gaussian function is a limiting case because the derivative of a Gaussian function is another Gaussian. The Gaussian function comes up in the central limit theorem for similar reasons. It's generally true that resolving something precisely in the time domain requires a wide bandwidth and vice-versa, and the Gaussian function is a "middle ground" which maximizes the rise and fall times while minimizing sidebands to the extent mathematically possible. This is because the Fourier transform of a Gaussian is a Gaussian. So in this sense, the minimal bandwidth keying envelope for CW would be a Gaussian function. The "Coherent CW" folks use something similar. Very slow CW is keyed at zero crossings with Raised Cosine envelope to give minimal bandwidth. Rob Sherwood NC0B of Sherwood Engineering Inc. did a study and produced a video showing that the rise time (and presumable the fall time too) is the key to reducing bandwidth. He compared rise times of 1 ms to 10 ms. Too fast of a rise time significantly increases bandwidth. To answer Dominick's question, I looked at the CTU (Contest University) files. Rob has mentioned this in nearly every one of his presentations every year he has spoken. THey can be found in the videos here or the files here. First off, there is no such thing as a signal with zero bandwidth. That is like the imaginary line between two imaginary points - the line with no width between points of no size. There simply are no such things except as theoretical constructs - end even then, to prevent dividing by zero, they always must be expressed as limits of variables as they approach zero. CW transmitters always begin at zero output (what you are calling a zero-crossing, but at the boundary condition) until they are commanded to produce a signal by the closure of a contact on a key or by other means. Then they return to zero when that output command is removed. Note that as this is displayed in the time domain relative to the keying frequency, the actual carrier is not visible. So even if the modulation itself (the key, acting as a switch) is a square wave, the resulting output is not truly square due to the physical constraints of the components of the transmitter. This is true for both the rise and fall of the envelope. In this plot, relative to the carrier frequency, it is clearly seen that in a practical sense the transmitted wave envelope does indeed begin and end at the boundary conditions of zero. Of course, philosophers have been known to argue that it never actually reaches zero - just gets closer and closer to it. Then the quantum physicists bring up the Planck limits, and so on, ad nauseaum. Note that this is a plot of a signal modulated by 1 KHz square-waves, which is why the bandwidth is spread so widely. At 1 KHz keying, the ratio of signal to modulation frequencies are getting to the point where it is producing sidebands. The amplitudes of the sidebands fall off in the normal way. This plot does not show the effects of input filtering. Consider a generic mixer circuit - the output should always be filtered in such a way that only the desired modulated carrier is the resultant output. The risetime portion is as if it has been modulated at some very high rate. That produces spurious emissions in the driver circuit which are then filtered out. They should not be within the bandpass of the final power amplifier. But since no filter is perfect some of those spurs will end up on the output. Hence the need for guidelines regarding limitation of spurious emissions. These are specifically regulated for FCC Type-Accepted commercial transmitters. Ultimately, you want a transmitter that exhibits higher Q as a measure of how well it applies available power to the desired output frequency for higher efficiency. the transfer function of a real transmitter is NOT linear. i.e., a square-wave input (where the rise and fall time is as if the frequency of modulation is at the boundary condition of the limit of it being at infinity, where the limit of the period of modulation approaches zero. Bottom line is that since there is no carrier between the Morse elements, the output always begins at zero and ends at zero. Hand keying is at such a slow rate as compared to the carrier frequency that it is not very relevant. The O-scope trace at the top is taken from a 630 Meter transmitter, and even then the modulation rate is still so slow compared to even that low of carrier frequency that there are no clear artifacts introduced by keying at random time relative to the carrier oscillations. It is the modulation frequency that is the dominant factor in producing the final signal bandwidth. As an aside, back in the day when the FCC had monitoring stations all over, I would visit sometimes and watch as they used what they called "TXID" - Transmitter identification - the way a signal from a CW or FM transmitter wanders in frequency and amplitude as they were keyed up. They were very good at this, and often could tell who was transmitting before any identifying modulation was applied. i.e, saying or keying a callsign. They told me that even with the same models of transmitters made on the same production line on the same day there would be measurable differences due to the tolerances of the various components that went into the final product. They considered this to be closely-held information at the time. From a mathematical point of view, any finite length (e.g. keyed) signal has infinite bandwidth. You can reduce the side-bands by choosing a keying envelope whose FT has low sidebands, which implies slowed rise/fall times of the envelope and to a diminishing degree all its derivatives. Not the answer you're looking for? Browse other questions tagged cw theory bandwidth or ask your own question. Bandwidth of a CW signal? Single or Dual Paddle Key? How do I send negative numbers or below zero in CW? Why do CW signals get converted to pure sine wave tones at 750 Hz?